So-Bar is everything you would expect from a sophisticated Mobile Bar. Great Cocktails, shooters, bubbles, beer and gin bar. The only difference is it serves No alcohol. It’s a bar for when you don’t feel like drinking. For the “mindful drinker” You may not want to overdo it and switch during the event. You may be driving, you may be trying to impress your date or your boss and don’t want to say anything dumb ! Whenever you choose to go to a function or event and skip drinking, even for one night, it’s quite uncomfortable. The bars want you to drink. The bartenders want you to drink. The other people there want you to drink. So it’s hard to say no especially when the alternatives are not at all inspiring. 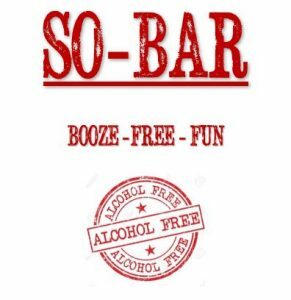 So-Bar gives you the licence to have fun but without the effect of the booze and the hangover the next day. Oh and the drinks are delicious. Great beers, “tequila face” shooters (without the tequila) lovely cocktails and an incredible gin bar. Yes ! There is such a thing as non-alcohol gin and you gotta try it ! Oh and sparkling wine, and great vibey barstaff. No hangover, No empty calories. More endorphins from laughing and connecting with people. More energy the next day. Why shouldn’t we have events where the not-drinkers’ experience is the star, not the side-dish? Why don’t you party planners spoil people who don’t want a boozy night, are teetotal by choice or by religion, have a triathlon the next morning ? Why not have a So-Bar as an alternative to a booze bar or have them both? That’s why I’m stoked about creating a concept where people are into the idea of not drinking, or at least down to try it. As far as good vibes go, I’ve found not drinking to be surprisingly underrated.